And today I have a recipe for the Detox Winter Salad I was making during this video! 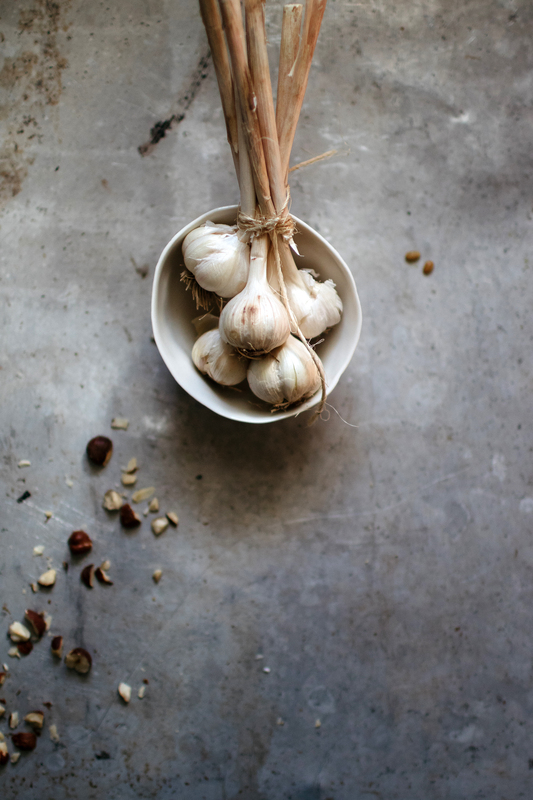 It’s so ideal for your post-Thanksgiving stomach because it’s 1. simple to make 2. has loads of fiber from the wheatberries to give your system an extra push during the post-holiday slug and 3. it’s full of fresh and seasonal ingredients for an immunity boost! Now that those leftovers are finally gone, let’s get our bodies back on track before the Christmas cookies start making an appearance. 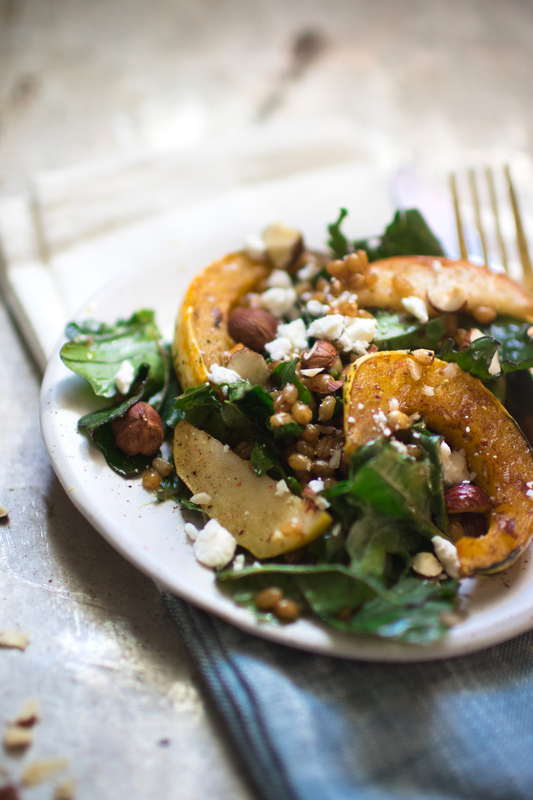 A delicious and sturdy winter salad filled with squash, apples, hazelnuts, cinnamon, and wheatberries. Coat squash wedges with 1 Tablespoon olive oil, 1 teaspoon sea salt, cinnamon, and a sprinkle of pepper. Bake for 15 minutes. Toss apples in 1 teaspoon olive oil and a dash of salt and pepper. Flip squash and add apples to baking sheet. Bake for another five minutes and then add hazelnuts onto the tray and bake for an additional two minutes or until the apples and squash are easily pierced with a knife. Toss the squash, hazelnuts, apples, wheatberries, kale, and dressing together in a serving bowl. This salad looks beautiful and perfect for the time in between holidays, and I loved seeing the behind the scenes in the video. Shelly, that video is amazing! I love the behind the scenes look at everything that goes into a single post. You’re a hard-working rockstar, that’s for sure! This recipe and its photos are stunning––detox much, much needed. Shelly!!! I love the video! It was so great to see your behind-the-scenes process for your recipes and photos. I must say that this salad was spectacular. I hadn’t cooked wheat berries at home before. They are such a great change to my usual go-to salad additive, quinoa. I love their texture and nutty flavor! We are still dealing with leftovers here at our house, since we went over to friends’ house for Thanksgiving. We ended up doing Thanksgiving AGAIN at our house. For just the two of us. Yeah, so this salad is helping out with balancing the naughty with the nice. XO! Oooh Shelly, I love that you added a touch of cinnamon to the roasted squash and the dressing! Brilliant complement to the tang of mustard. Cannot wait to try—especially as you know how much I adore your video! YAY! I stumbled upon this recipe, which sounds amazing. I’m a wife and mother who makes vegetarian days two to three days a week. However, I have never heard of wheatberries before. Where do I find them? Are they only found in health food stores? Hey Kim! Wheatberries are usually found in the grain section of your grocery store. If your store carries quinoa or millet or even rice, I’d check with those. Hope that helps!